Molly Sawyer has been writing online since 1998, covering topics such as dog care, breeding and genetics, financial and tax information, and holistic care for people and pets. Sawyer holds a Bachelor of Science in animal science from Michigan State University. Arnica montana is a popular homeopathic remedy that has been in use since the 1500s, according to the University of Maryland Medical Center. Creams, ointments and gels containing homeopathic arnica are intended for topical use. Arnica can be toxic, so only the homeopathic pellets--which contain an extremely diluted concentration of arnica--are considered appropriate for ingestion. Arnica 30C pellets are commonly available in stores that carry complementary and alternative health products. 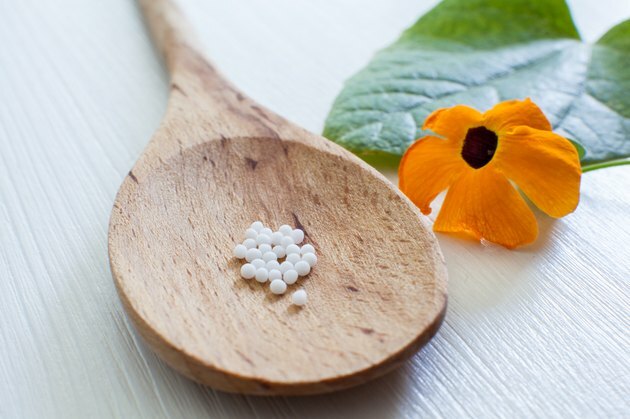 Homeopathic remedies are prepared by diluting the original substance at a certain ratio a certain number of times. Potencies are categorized by their dilution ratio: the decimal or “X” potency, a one-in-10 ratio; the centesimal or “C” potency, a one-in-100 ratio; and the 50 millesimal or “LM” potency, a one-in-50,000 ratio. Although it seems contradictory, homeopathic remedies become stronger the more dilute they are; the “X” potencies are the lowest strength. The number that comes before the potency letter describes how many times the original substance was diluted. One part of the original substance is added to 99 parts of the dilution substance for 1C potency; one part of the 1C solution is added to 99 parts of the dilution substance for 2C potency. Arnica 30C, therefore, is a centesimal potency that has been diluted 30 times. Arnica is best known for its effect on bruising and swelling. Take homeopathic arnica 30C pellets after an injury or fall to minimize the development of edema and swelling. Arnica after a vigorous workout or extensive physical activity such as gardening or moving furniture can help to prevent muscle aching and stiffness. Andrew Hobson, a registered and licensed homeopath, recommends arnica 30C for sprains and strains, painful or bruised insect stings, and general shock after an injury. You can also take arnica 30C for broken bones and head trauma, but seek medical care in these cases as well. Arnica’s antimicrobial and anti-inflammatory properties make it a valuable adjunct to pain medication after surgical procedures. The American Society of Ophthalmic Plastic and Reconstructive Surgery recommends patients take homeopathic arnica before and after surgery to minimize bruising and swelling. Hobson suggests arnica 30C before and after dental work. Discuss arnica use with your surgeon or dentist before your procedure. Depending on the other symptoms you are experiencing, arnica 30C may be an appropriate and helpful remedy. Homeopathic arnica has been recommended for conditions such as burns, asphyxia, bleeding due to trauma, stroke and choking. In emergency or severe situations, arnica should be taken on the way to the doctor’s office or emergency room, and not as a substitute for medical care. What Is the Difference in Arnica Montana 30X & 30C?